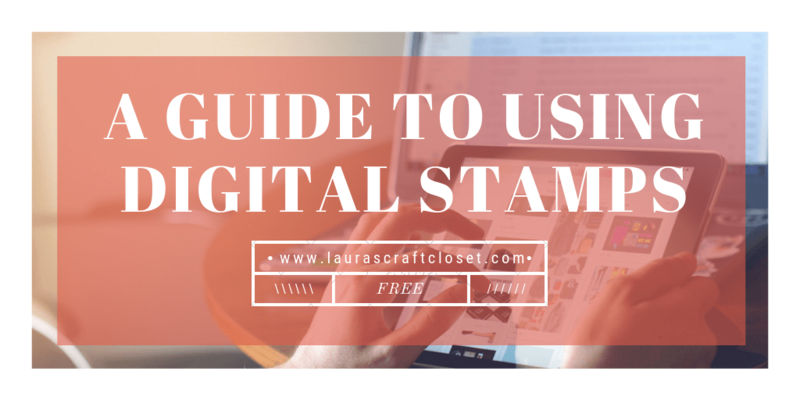 Whether you’ve been a paper crafter or stamper for years, or have just recently made your way here, you may have heard of digital stamps or “digis.” Here is a guide I created showing you how to use digital stamps. While downloading and using a digi is relatively simple, it’s often reassuring to know what steps to expect before going down the rabbit hole to acquiring and using digital stamps. This guide will step you through the easy process and have you making beautiful projects with digital images in no time!! Digital stamps have recently become popular, with many designs from great artists and the ability to immediately acquire and use them. At their most basic, digi stamps are black and white images that can be downloaded and printed, and then colored and used similarly to traditional stamps. I’ve begun using digis more and more, thanks to being on a creative design team that has lots of sponsors who specialize in digital stamps. So if you want to try to win a few fanTAStic prizes from these companies, try your hand at one of our challenges and submit your creation! With multiple challenges every month, everyone has a chance! Can I still use my other stamps? If you’ve ever been curious about using digital stamps, but don’t want to give up your stamps, DON’T WORRY! They are easily used in conjunction with all of your stamps and stash of paper-crafting supplies. You’ll see in my digi projects that I combine digis with my stamps! I would never give up my physical stamps, but playing with new digital stamps definitely has it’s rewards! I like immediacy. Who doesn’t? If I need a specific type of stamp, I can download it and be creating something with it in MINUTES. Being able to adjust the size and orientation of the image also allows you to be even more creative! Read on below and I’ll show you how in the steps below. Some digi files even include a pre-colored image — bonus for those of us who aren’t sure how to get the shadings just right! Papercrafters have the needed supplies already! Use them with your regular stamps and make new combinations with your new design opportunities. I get to use my stash 🙂 With a computer and a printer, you are all set. Nothing to physically store. I work in a small craft closet, so storage space is a consideration. There are a few disadvantages, but I find them to be minimal. I like the feel of using a real physical stamp. It is difficult to mask your images. Digi images can also be difficult to heat emboss. Regular printer ink also may bleed with water coloring techniques. Let me show you how easy it is to use digis, and some tips to get the most out of your new digital stamps! Once you work with a digital stamp, it’ll be easy to do it again. Or bookmark this page and revisit these steps! Read below! Getting started is the easiest (and most fun) step: Find a digital stamp you like. There are so many available, more being created everyday, and many companies offer a few freebies. Free digi stamps are good if you are hesitant to try them and worry about how to download them (it’s easy, you’ll see!). If you don’t already have one in mind, try Etsy or use a search engine to search for “digital stamp,” but be prepared for LOTS of options! Or if you like any of the images from my projects featured above, click it and I have the digital stamp site linked on the page. From there, you can also search around for a topic that interests you. You’re bound to find something you’ll like to try. Pinterest is full of digital stamps, too. The digital stamp I’ll be using for this guide can be found at Sparkle N Sprinkle. 1. Once when you find a digital stamp, purchase it or hit “download” for a freebie. 3. If your file or files are contained in a zip folder (denoted with a .zip extension at the end of the file name), you’ll want to unzip it to open it. Most computers already have a program to open these files automatically with a double click and put them in their own folder. Mine didn’t, so if yours also doesn’t, make sure you download a zip file opener. For my iPad, I find that UNZIP works really well, and helps me to keep my files organized at the same time. 4. If you double click on your file folder, you’ll see the individual files within your new unzipped folder. TIP: This is a good place to explain the difference between .png and.jpg files, as these are both popular and widely used formats for digital stamps. Many digital sets will be sent with both. A PNG file has a transparent background (sometimes visualized within your file folder as a grayish tint), while a JPG file is opaque. For basic printing of images, the difference isn’t crucial and you can use either one. But if you plan on overlapping images, you’ll want a transparent background (.png file) so an opaque background doesn’t cover up the second image. 5. Open a word processor (Word or Pages work great) and create a blank document. Click on Insert image (this step could also be found under an Edit in the title bar). 6. This will open up your files, so find which image(s) you want to work with before you print. 7. Double click on your chosen image, and it’ll be inserted into your document. 8. From here, let’s talk about some easy advanced techniques you can do to personalize your new digital stamp. These are not necessary, but definitely fun! Adjusting Size. For some projects, you may want your image or sentiment as large as the card, or small for background. Grab one of corners and drag to the size you want. I knew I wanted this image to be 3 1/2″ tall. Duplicates. I often print out a few copies of my new stamp in varying sizes and use whatever feels the best (or use multiple prints on a single card like I did for this sweet fox card). Make sure your image is selected, then copy and paste. Each of these copies can then be edited, size-adjusted, and changed separately. Make sure your images have enough space around them, especially if you plan on using the white space on your card or project. I often fussy-cut them out, so I put them close together so I can print as many as possible and use minimal sheets of cardstock. Mirror-image. This is a really great one to use with digital stamps. With regular rubber stamps, it takes extra tools to be able to get a mirror-image, but with a digital stamp, you can manipulate it before it’s even printed. Under your options, find “flip horizontal.” I love this function! Consider putting your digital image within a template before you print it out for perfect placement. 9. When your image(s) are as you’d like them, print your images onto white cardstock. Bonus tip: Print your image on some colored or patterned cardstock. The possibilities are endless! From here, you can use it like any other stamped image. Color it if you left it black and white. This way, you can really make your project your own. Fussy-cut your image out or use an electric cutting machine. Embellish and layer it up! Create a project out of it! Have fun with it!! See the project created with this happy kitty digi next week! While you are there, check out the selection of Designer Series Paper (DSP)! It’s so easy to match how you color the image to the papers! Ordering from me not only gets you a fantastic crafty Stampin’ Up Demonstrator (woo! ), but also helps to sustain this blog full of techniques and guides! Double win! I hope you found this guide useful. Bookmark the page for easy reference. If you have any questions, leave a comment or send me an email! Some more of my projects with digital stamps are pinned here. Next week I’ll be back with a digital image project that you aren’t going to want to miss. Guess what image I’ll be using!! Click that Follow button so you don’t miss out! See you then 🙂 Happy Crafting!